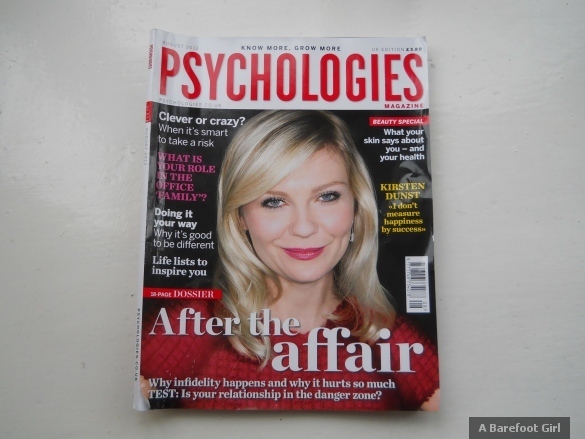 I've been an avid read of Psychologies Magazine for quite some time, and even these days I find that I'm really only reading it for David Baddiel's page (I sometimes swear that man is in my head, which is a little bit disturbing!! ), there are often little gems that really do hit-home with me. I've always felt a slight sense of not fitting in, as if all of my choices are the "wrong ones", because other people don't seem to agree with them. For a long time, especially when I was much younger, the sheer mention of wanting to be a writer was often met with distaste, purely because this appeared to mean that I "didn't want to earn money", or that I wouldn't be bringing anything "useful" into the world. For a long time, those feelings and other people's opinions got me down, and I almost gave up on my dreams to find jobs in areas that I wasn't interested in. 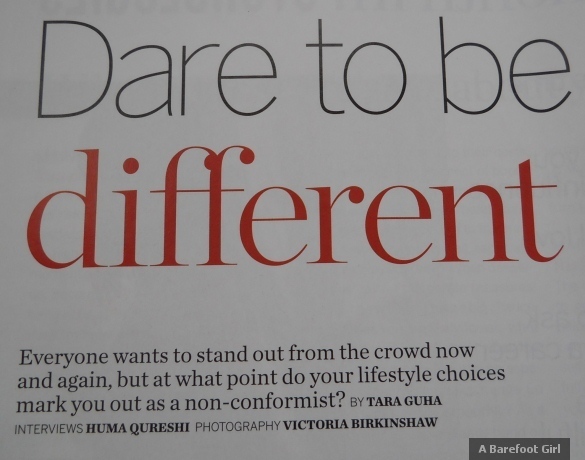 When it comes to my freelance writing, I'm glad that I managed to build-up the confidence to ignore the past naysayers (and even the ones that still look down their noses at me for choosing this path - you know who you are! ), because at the end of the day, this is my life. And in my life, I make my own decisions, not anyone else. Oh my god, this really could have been said by me, and probably has been, a million times over. Yes, I'm 28 years old and no, I do not want to drive. Some people, I don't think, will ever be able to understand this, but it's just never been a desire for me. Looking back at my childhood, I'm not really sure why. Both of my parents are drivers, and we've always had a car in the family. My oldest brother has had a car since I was in Year 3 at Junior School, and my other brother passed his test when he was eighteen. Nevertheless, whilst we have family photos of the younger of my brothers sat behind the wheel of my Mum's car, pretending to drive it from a very early age, I just never had any interest. Cars have been a huge part of my life. I have fond memories of my oldest brother coming home from University and driving the three of us over to the UCI Cinema in Hull, I absolutely loved those trips, and do kind of miss them now that we're all older and moved on, in life. I have memories of the long drives to our family holidays in Wales, with tape cassettes of The Shadows, Andrew Lloyd Webber or some early nineties artist that I probably wouldn't be able to name, even if I tried, depending on who was driving, and in which car. Maybe I'm just happier being a passenger. Maybe I like train journeys too much. Or maybe the idea of driving scares the flipping crap out of me. Honestly, if you asked me to write a list of the pros and cons of why I should learn to drive, the list of Cons would probably be an entire novel, whilst the list of Pros (albeit very good Pros) just couldn't defend themselves against the Cons. I've accepted that I will probably never learn. I was offered lessons when I turned seventeen, just as my brothers had, but I turned them down, and took the money instead. When I left Uni I got my Provisional Licence and people thought "yes, she's finally going to learn to drive" and for a while this seemed to be enough to keep people quiet. But the truth is, I only got my Provisional so that I could use it for ID, since I was always being told that I looked young for my age. At one point, my oldest brother (I bet he doesn't remember this) turned around and said that if I learnt to drive he would buy me a car! To which I replied that if he bought me a car, then I'd learn to drive. Funnily enough, he wasn't keen on that idea! 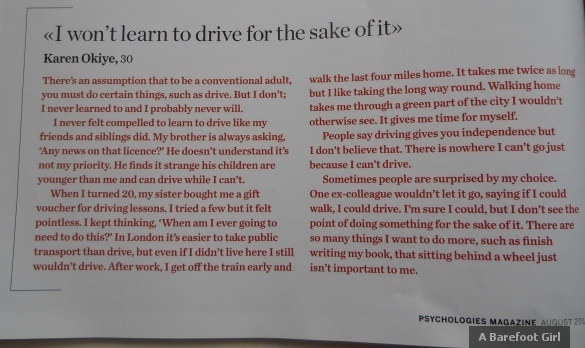 One of the reasons mentioned by the lady in the article, of why people think she should learn to drive, is one that I've had before as well, and that is that a car is all about gaining "independence". But like the interviewee, I agree that it isn't about independence at all. Not having a car doesn't stop me from working. It doesn't stop me from doing my food shopping, by myself. It doesn't stop me from visiting people. Of course there a places that are more difficult to get to, but is that really the end of the world? Another issue is, that when people talk about my not driving, they always bring a car in the equation. However, I don't think I could afford to buy or even run a car, even if I did want to. The point is, that I have chosen not to drive. I wish that people would learn to accept this. I know that they might not understand it, and I don't expect them to, but harping on at me all the time, is not going to somehow encourage me to change my mind. In some way, it makes me even more adamant that I don't want to drive. My mum learned to drive because it seemed like the thing to do when you reach a certain age. But after she passed she never drove after that - which seemed pointless in my opinion. I started lessons as soon as I turned 17 because I really wanted to drive! I've had my license for a good number of years now, but since I got a new job 6 months ago I only drive on the rare occasion as I mostly take the bus. I much prefer this as it gives me time to read a book or listen to music or just watch the world go by. Also you wouldn't think it but I get terrible road rage! I don't think driving makes you "independent". I know people who aren't independent and drive because they can't face learning how to use public transport.